Having established the Kelmscott Press in 1891, partly in reaction to the growing mechanisation in the printing trade during the Victorian era and the resulting decline in the standards and quality of mass-produced books, William Morris went on to become the most celebrated book designer and publisher of his era. The Kelmscott Press was to return to the basics of letterpress printing. Morris was particularly influenced by early manuscripts and printed material, including incunabula books printed after the invention of moveable type between the 1450s and 1501. The type used in Kelmscott Press publications was hand-set and printed manually on a cast iron hand-press, which in principle differed little from the wooden presses used in the incunabula period. Morris sourced only the finest quality paper, ink, vellum and bindings and developed his own fonts: Golden, Troy and Chaucer. He also designed initial letters and decorative borders and commissioned artists as illustrators – the most successful being his close friend Edward Burne-Jones. The Kelmscott Press produced fifty-two titles between 1891 and 1898, including what is widely regarded as one of the most outstanding books ever printed, The Works of Geoffrey Chaucer (1896), included in the exhibition Morris & Co. The example set by the Kelmscott Press inspired the private press movement in England at the turn of the nineteenth and twentieth centuries. Its legacy is still apparent today; its emphasis on quality influencing modern fine printing presses around the world. Many New Zealand printers have pursued book production as a craft rather than as a mechanised trade and produced very high quality books. In his 1966 article ‘Typographical Printing Today’, Denis Glover noted that New Zealand’s ‘typographical renaissance did not take place until the early [nineteen] thirties – not more than a dozen years behind the authentic renaissance in England’.¹ He went on to credit Auckland typographer Bob Lowry for getting quality book production underway in New Zealand at this time – Lowry, with Ron Holloway, formed the Unicorn Press in the early 1930s. Other New Zealand presses of note which have focused on hand-printing include Wai-te-ata Press, Otakou Press, Holloway Press, Hawk Press and Pear Tree Press. The following three books are among my personal favourites to have been printed in New Zealand and, while they differ in appearance from the Kelmscott Press books, they are invariably linked to its tradition in the use of the craftsmanship and skill of the letterpress printer, incorporating quality materials and taking care to produce an object of beauty rather than the mass-produced and impersonalised machine-made product which dominates much of the printing industry. Although primarily a commercial printing firm, Christchurch’s Caxton Press also produced a number of high quality, limited edition books throughout the 1930s, 40s and 50s. One of the highlights remains Samuel Taylor Coleridge’s The Rime of the Ancient Mariner, published in 1952 and illustrated and designed by Leo Bensemann, one of New Zealand’s most accomplished typographer / printers. Bensemann carefully considered the layout of the text and illustrations and also sourced handmade paper from the Hayle Paper Mill on the Loose Stream in Kent, England. 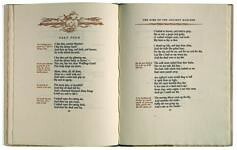 The Rime of the Ancient Mariner remains a highpoint in New Zealand book production during the post-war era. The Hawk Press was established at Taylor’s Mistake in Christchurch by poet and printer Alan Loney in 1975, primarily to print contemporary New Zealand poetry. It operated until 1983 and produced twenty-one titles, which Loney designed, set and printed by hand. For me, the most significant book produced by the press is Bill Manhire and Andrew Drummond’s Dawn / Water (1979). The poet, artist and printer all successfully collaborated to produce a book that is an artwork in its own right. Loney is at the forefront of hand-printed book production in Australasia and has established his latest press, Electio Editions, in Melbourne. 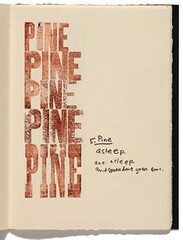 Manhire’s poem PINE was published by the Otakou Press at the University of Otago Library in 2005. 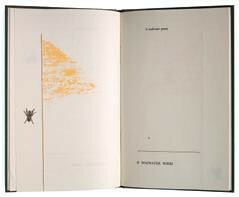 This book was devised by Ralph Hotere, Manhire and Wellington-based printer Brendan O’Brien. Hotere interprets Manhire’s ‘concrete’ poem using a range of wooden type to spell the word Pine, repeated vertically and rearranged for each separate page. Each page is unique, with variations in the inking of the wooden type achieved through unconventional printing methods incorporating the use of brushes to apply ink. Peter Vangioni is a curator at Christchurch Art Gallery. He has a long-held interest in hand-printed books, and operates his own printing press from home.